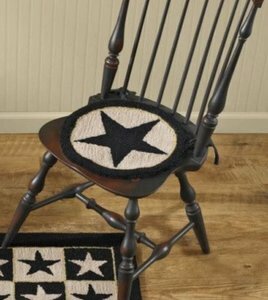 Here is a simple design for your country or farmhouse style, the Black Star Hooked Chair Pad. This popular wool hooked rug design is in a washable poly loop yarn. A comfortable addition to any stool or kitchen chair. The scents of sheep in a field is captured in this best seller the Willow & Sheep Hooked Chair Pad. This is the popular cotton hooked design that has been re-introduced in a washable polyester. Beautiful on any stool or in your kitchen chairs!